Authors Barbara Ehrenreich and Deirdre English decided to investigate the 'experts' in the fields of marriage, child-raising, and domesticity during the past two centuries. Who decided that these people were experts? Were their findings actually scientific and unbiased? Most importantly, what effect did their advice have on the women who utilized it in their homes and their lives? This book gives a lot of interesting insight into the ways that women have been defined by American culture. It begins with the Industrial Revolution at a time when the family was split up. While the entire family once worked together for the common goal of survival, men soon left the home and the family to go work in cities. The very tasks that women had done in the home were now accomplished in factory assembly lines. Now they were instructed to create welcoming, non-stressful environment for their husbands when they returned at the end of the day. The gap between men and women and work and home life was widening exponentially. 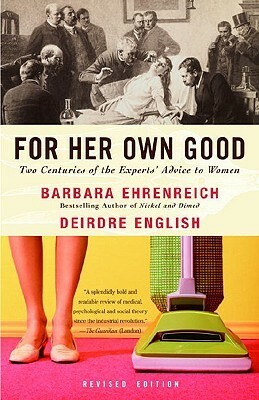 From there, Ehrenreich and English delve into the fields of medicine, domestic science, and mothering. Reading For Her Own Good may lead to frustration, outbursts, and book-throwing. It's incredible to realize that men in positions of power created a culture of female submission and then used medicine to subdue women who dared to assert any authority over their lives. It's no wonder women feel like they can't possibly do a good job raising their children when they are admonished in one decade not to baby their children and then told they are not giving them enough attention just a few years later. While this book takes a more academic tone, I still found it incredibly interesting. At times, the biases of the authors are evident and there are moments when they seem to wonder off topic a bit. While it is decidedly not a book you can speed read, it is a book that will make you reflect on the expectations placed on women both in the past and the present. This is interesting, but I would probably throw it across the room! I think we still have a long way to go with gender expectations, but I suppose it's nice to see how far we have come? I would certainly understand the impulse. It is good to see the progress we have made, but it's incredible that people were allowed to stay in positions of authority when they were basically making things up. Hm.. this sounds interesting, but like you and Sam have said, quite frustrating. I haven't actually heard of this before which is weird because I feel like I should have long ago. It might be something I can read for future magazine reviews, so thanks for the heads up. It's books like this just let us know we still have a long way to go! Although it's bound like a novel, I think you might be more likely to find it in a women's studies program at a university. It's definitely academic in tone, but the results of their research will make you shake your head in complete disbelief. This does sound interesting, albeit infuriating. :-) I'm adding it to my list. I think it's good to read some things that make you mad. This book puts so many conventions into a completely new light. sounds like a fun and thought provoking read. I like Ehrenreich so I would probably enjoy it. thanks for the great review! This was actually my first book written by her, but I've heard great things about her Nickeled and Dimed. Have you read that one?